Nigeria, 16 May 2018 – The final event marking the African Vaccination Week (AVW) ended in Abuja with calls for civil servants to become immunization champions. 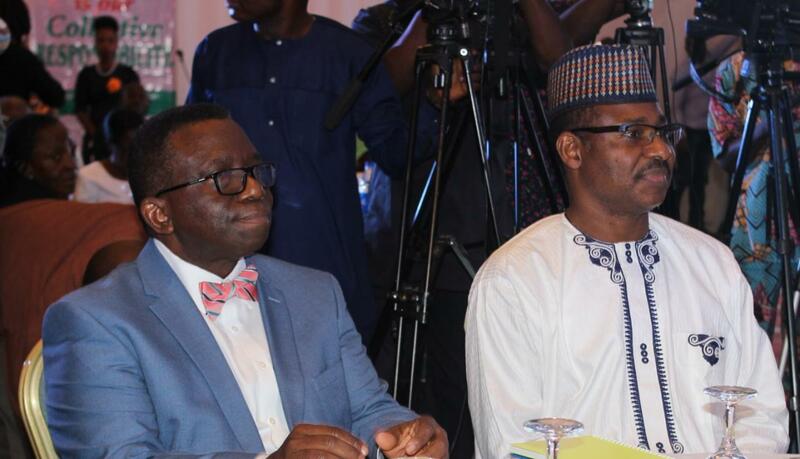 The call was made by the Minister of Health Professor Isaac Adewole at a sensitization workshop for three hundred (300) civil servants on the “giving back to my community” project. The event which was organized by the National Primary Health Care Development Agency (NPHCDA), Ministry of Health (FMOH), Head of Service and development partners was part of the activities lined up to mark the AVW. The Minister of Health, Professor Isaac Adewole, urged the civil servants to always visit primary health care facilities to check what is going on. “You can adopt a health facility and work with your communities to make sure that health workers provide the much needed immunization services to your communities” the Minister said. The Executive Director NPHCDA, Dr. Faisal Shuaib noted that primary health requires inter-ministerial collaboration as it is not the work of the Ministry of Health alone. He urged civil servants to use their new role to give back to their community by playing the role of advocates and also ensure full ownership of primary health facilities within their domain. Representing the World Health Organization (WHO) Country Representative, Dr Fiona Braka explained that immunization coverage in the country is at an unacceptable low rate of 33% with one in every ten children dying before the age of five years. To address the challenge of low immunization coverage in the country, “the NPHCDA declared a national emergency on routine immunization with the target aim of reaching of 84% of children by 2028”. Dr Braka urged all stakeholders to add their voice to raise awareness of the benefits of vaccines, and to be immunization champions wherever they are. Major highlights of the AVW 2018 in Nigeria included engagements with the private sector and civil society to advocate for more resources for immunization, provision of integrated immunization services to underserved communities across the country, health education outreaches, school competition, AVW walk / rallies to create awareness about immunization, rebranding of immunization so as to keep it on the public agenda, and creating a critical mass of immunization champions.